On the left panel of the Configure Actions window, the available checkers are listed in alphabetical order. You can use the right-side scroll bar for browsing this list. Alternatively, a search box is also provided where you can type keywords. 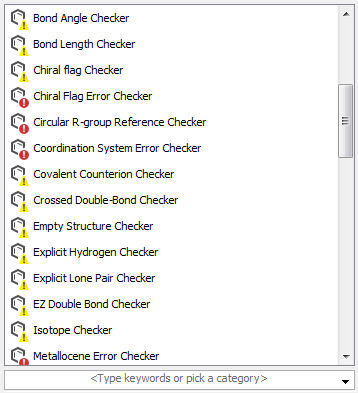 Feature detecting checkers: Feature checkers search for selected molecular characteristics that are generally not considered as errors (e.g., query properties). This checker can be rather regarded as a warning that there is an unpreferred representation in the structure. Click on the name of the checker to see its description in the information panel. The right part of the Configure Checkers window displays the Configuration panel. This panel shows the checkers included in the Structure Checker configuration. 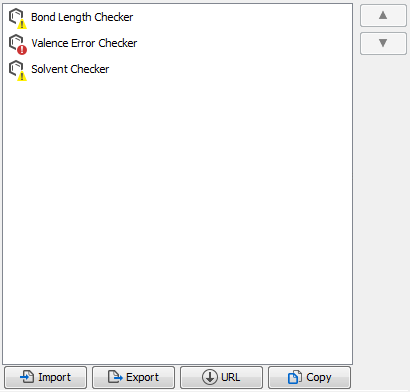 This list is empty by default but a selected checker can be easily moved to the Structure Checker configuration by pressing the Add configuration designing button situated in the middle. A selected checker can be deleted from the configuration by pressing the Remove button. To clear the whole configuration list, press Remove All. Checkers are executed one-by-one in a preset order defined in the configuration list. To change this order, select a checker in the list and use the right-side arrows to move it up or down. If you click on a checker that was already moved to the Configuration panel, fixer options appear in the information panel that can be tuned according to user needs. Predefined configurations can also be loaded by clicking the Import button. Select the Structure Checker configuration file you would like to use and press Open. The set of checkers will be loaded to the Configuration panel. You can also provide your xml configuration file via a web address if you press URL. Enter the URL in the window and click OK. 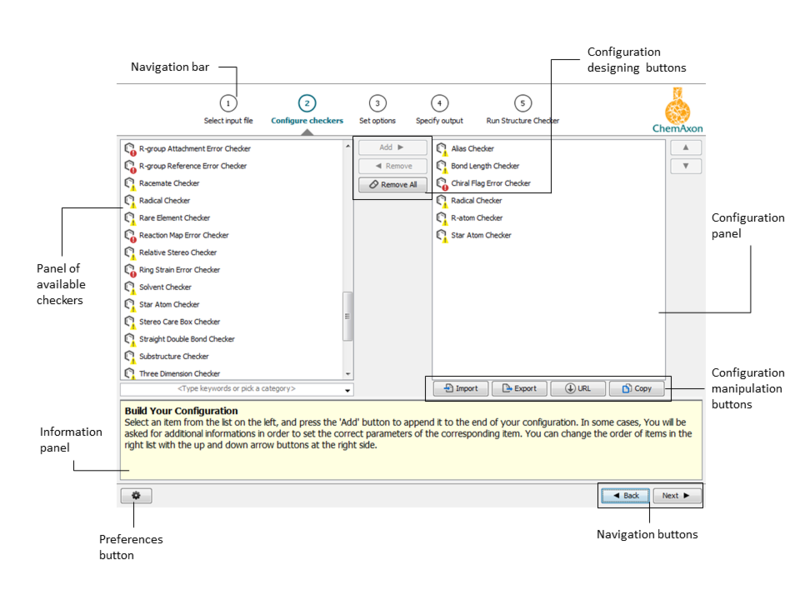 This option enables the use of the same Structure Checker configuration by multiple users. However, configuration data cannot be edited and further customized. A created configuration can be saved in xml format by the Export button. Browse the location of the file, specify its name and press Save. You can also copy the actionstring representation of the created configuration to your clipboard by clicking on the Copy button.You can use this text with e.g. the Structure Checker command-line tool or Cartridge. Once you have set up your configuration, you are ready to start your structure checking process!